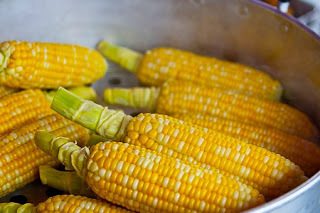 Refreshing Daily in God's Word: Daily Devotion: Where Is the Corn and Wine? Key Verse: Verse 12 – “They say to their mothers, Where is corn and wine? when they swooned as the wounded in the streets of the city, when their soul was poured out into their mothers' bosom." There is a famine in Israel because of the sin of the people (Lamentations 1:8). As a result of this famine, children are dying of starvation. How sad to hear your children ask for food and you have none to give them; and you watch them swoon and die in the streets. Some years ago, I heard my oldest child talking on the phone. She said, “We don’t have any money, but we can send food.” I was curious as to who she was talking to until I went into the living room and saw the television was on and they were giving a report on the children dying of starvation in Ethiopia. As I gazed at the TV screen, I couldn’t imagine the horror of watching my children die from a lack of food. That was Israel’s condition. They had turned their backs on God and turned to other gods; and their consequences were astounding. All around the world today children are starving to death; and as sad as that is, there is a death that is far worse and that is to die without Christ, which is to spend an eternity in hell. As a pastor I ache as I watch children of any nation starving; but I hurt and sorrow even more watching young people reject Jesus Christ and go off into eternity without Him. Today, we have the food of God’s Word. Let’s share it so our children will not starve to death spiritually. ✞ Come to Jesus, He is the Bread of Life.